We were driving home on a Saturday in late October 2016 when we saw the Steamboat Animal Hospital message board. “PUMPKIN SPICE KITTENS!” it proclaimed. We had been waiting for my mom to finish cancer treatments before adopting a kitten. Even though she still had to undergo radiation therapy, the opportunity was too good to pass up. When we arrived at Feline Friends half an hour later, Jo informed us that all of the pumpkin spice kittens had already been adopted. We decided to look around and play with some of the cats anyway, hoping to find our forever feline. We pet some of the kittens and adult cats, but it was two “kittens” (who had just turned six months old) who stole our hearts. 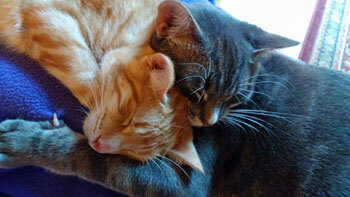 Butch (gray, now Yogi) and Sundance (orange, now Bliss) were described as being “really mellow”. They had been adopted two weeks earlier and returned after a week because they kept hiding. We were excited for mellow cats, though. They were more suited to our lifestyle. We were just approaching Yogi and Bliss’s cage when Yogi suddenly walked out to greet us. “He’s never done that before,” Jo told us, “not even for us.” That was the first sign that we were meant to be. Yogi later ran to hide behind a piece of furniture while I pet Bliss. It was adorable when his little pink nose sniffed my hand. As I pet his very soft fur and scratched behind his ears, he slowly blinked at me. He looked so blissful, so naturally I named him Bliss. “We’re coming back to adopt you and your brother,” I promised him. The next Friday, November 4, we were ready to adopt our cats. We had bought everything we needed, and my mom’s oncologist said it was okay for her to adopt cats. We had finally decided on Yogi’s name the night before, mostly because it sounded nice with Bliss. When we came back to take our kitties home, they looked happy to see us. The woman who was fostering them, Lori, hugged them and put them in the carrier we had brought for them. They instantly curled up together, a phenomenon we later labeled as “double stuffing”. My mom signed the adoption paperwork, and Jo gave us a bag of cat food and a bag of bonito flakes. We also received a bag with their vet records. When we got home, Yogi immediately ran under the bed while Bliss let us pet him for a few minutes. When I stepped out of the guest room that had become the cat room, I returned to find Bliss under the bed with his brother. That night, I played with the cats using what was at the time their favorite toy: a long blue feather cat dancer. Yogi pounced for the toy, while Bliss batted at it with an orange paw. Yogi also sniffed his catnip toys with his pink nose, which had a little white patch right above it. The next morning, I fed them their bonito flakes on a plate. Yogi ate most of them, while Bliss hid behind it. Later that day, Bliss let me pet him and I heard a sound that I hadn’t heard since my last cat was eaten by coyotes over four years earlier. “Dad,” I called. “Can you go outside and check the hose? I think it’s malfunctioning!” Of course, the hose was not malfunctioning. Bliss was purring! For the next week, Yogi and Bliss hid under the guest bed, coming out only for treats and food. I believe that the reason they hid was fear of being returned again. After they realized that we loved them and were going to keep them, they started interacting with us out in the main living spaces. More than a year later, I couldn’t imagine life without our cats. Bliss is the loving lap kitty who enjoys playing with a cat dancer that we call “Buggy”. He meows every morning for play. He will sleep on one of our laps for hours at a time and purr loudly when pet. He also enjoys some love on the living room rug, where he flips over adorably to reveal his white belly. He and his brother can often be found “double stuffing” in various places around the house. Yogi is the personality-filled cat that’s always up for an adventure. His favorite toy is “Mousie on a String”, a toy mouse on a length of hemp string. He loves to go outside, whether in someone’s arms or on his harness. He loves affection on the rug in the kitchen. Whenever my dad gets home from work, Yogi runs to greet him. We’ve loved every minute of our lives since we found our forever kitties.